As soon as colder weather hits, my thoughts turn to comfort foods. Foods that are warm and liquid that make me feel all cozy inside. And what can be more comforting on a cold winter day than a bowl of soup? Mushroom soup to be precise. I’ve made this soup every Thanksgiving for the last three years. I also tend to make in in the colder fall and winter months. It’s intensely flavored, fragrant and filling soup. People have been known to get seconds and some – thirds. When I was a little girl, it was one of the few things I would always have the appetite to eat. My mother served it to me with a thick slice of black, Russian bread with butter. This is an old family recipe. I’ve elaborated on it by substituting some shallots for some of the onions. I think it deepens and complements the flavor of the mushrooms and gives the soup a deeper, more complex flavor. My mother, ever so reluctant to have the family recipe altered, agreed with me after tasting my version. I insist on using only porcini mushrooms for this soup, otherwise the flavor is just not the same. 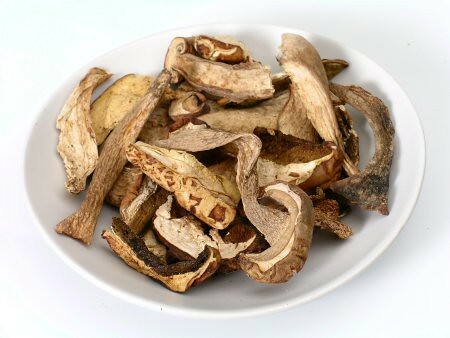 You can find dried porcini mushrooms in specialty stores, or order them online – their dry state does not weaken their flavor. I’ve not encountered fresh ones in the United States, however, back in Russia where I grew up, we feasted on the fresh ones in the summer and fall. Porcini mushrooms are distinctly flavored with a deep earthy, nutty, almost meaty flavor. It is my absolute favorite mushroom (other than a chanterelle, which gets second place in my book) and can be used to create an absolutely incredible sauce to mashed potatoes. Barley and potatoes add texture to the soup, so don’t skip them. You want stuff in your soup – stuff is very important, and fewer things make a meal more comforting than potatoes. The night before, soak the dried mushrooms in a quart of water. Chop the garlic, shallots and onions finely and sauté until translucent in butter in a sauté pan. Set aside. Remove the mushrooms from the water where they had been soaking overnight and mince them finely as well. Sauté with butter slowly for 15 minutes. Do not discard the water. While your mushrooms are sautéing slowly, dice the potatoes into small cubes and set aside. After your onions, garlic and shallots have been sautéed and your mushrooms sautéed as well, take the water in which the mushrooms have been soaking and pour it carefully into a large pot. Carefully because the silt and sand will settle at the bottom of the pot and you want to avoid pouring it into your soup. So, pour all but the remaining half an inch. Pour slowly to monitor the silt at the bottom. Add to your liquid 4 quarts of chicken stock or vegetable stock. Add the onion medley, the mushroom, the potatoes and the barley. Cook over a slow simmer for an hour before tasting. Then add salt, pepper and sugar according to taste. Once you achieve your flavors, let the soup simmer gently for another hour and a half. Serve with a dollop of sour cream in the centre.